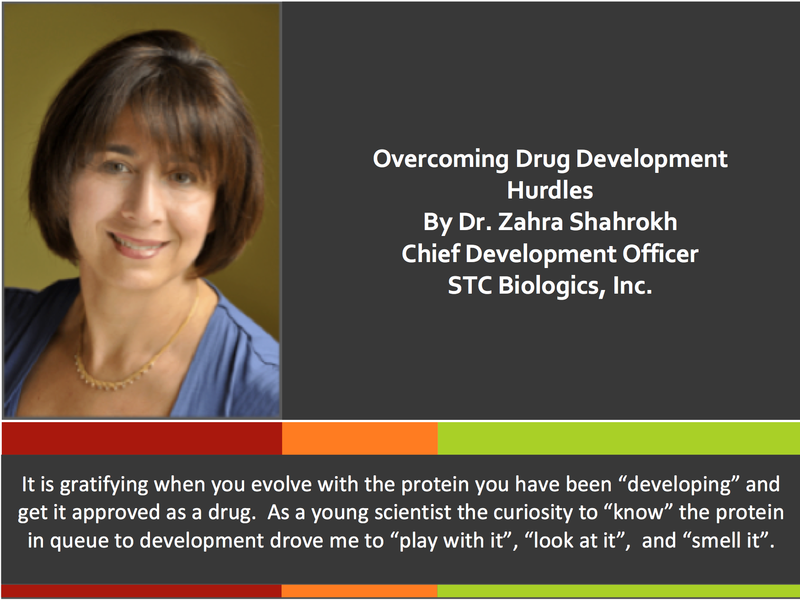 Insights Into Overcoming Drug Development Hurdles after Twenty Years of Drug Development Experience – STC Biologics, Inc.
By Dr. Zahra Shahrokh, chief development officer at STC Biologics, Inc. It is gratifying when you evolve with the protein you have been “developing” and get it approved as a drug. As a young scientist the curiosity to “know” the protein in queue to development drove me to “play with it”, “look at it”, and “smell it”. One such protein that came my way many years ago was being delivered via Alzet mini-pumps to animals in efficacy models for “candidate selection”. The results were not as promising as the His-tagged version. I obtained a milligram of the protein, developed SE-HPLC and RP-HPLC to determine the cause. I also examined the sequence and found that the protein had an odd number of cysteines. SE-HPLC results showed that it was ~10% aggregated, although by SDS-PAGE (which was the only purity assay performed at that time), it was mostly a single species and dimers. I mimicked the temperature and PBS buffer used to deliver it in the Alzet minipumps and found it 50% aggregated within the 2-week duration of the animal study. Then I performed a pH and temperature dependent stability study and found that pH adjustment prevented such aggregation during short-term studies. We soon had a product that worked in the animal studies and a drug candidate was selected. As I evolved with the protein, its next challenge was revealed. Besides solubility issues, fuzzy “tornados”, low expression level was also a problem. I examined the effect of metals and amino acids on the protein and found that the addition of Zinc increased its stability. In parallel, my Cell Culture Development colleagues put Zn into the media and the titers increased dramatically. Within the same month our Discovery colleagues solved the crystal structure and determined that one Zn molecule was required for coordinating with the three cysteines at the apex of the homotrimer for the protein to remain active. With an integrated (communicative and collaborative) approach to Development, we had conquered the first set of hurdles and moved the protein into the Toxicology phase. What about the “tornados”? I happened to examine like structures with shiny edges. I collected the precipitate and ran it on a Western blot. The precipitate consisted of protein crystals, not the aggregated unfunctional protein, and it was highly salt soluble! And thus the solubility issue was solved! Our Process Development group utilized the concept to develop a crystallization purification process. An economic and patentable process, yielding highly pure protein, resulted of what first appeared to be a no-go decision for this molecule. Next came another challenge. The product showed toxicity in a cynomologus monkey pilot tox study! The project came to a halt. With our product biology knowledge, we mixed the protein with various soluble receptors and ran it on SE-HPLC with on-line light scattering detector and determined that it trimerized the receptors. The Discovery team compared the sequences of the monkey and the human proteins. Human protein sequence having only a few amino acid differences from the monkey protein sequence near the cysteine residues at the apex triggered a signal that rendered the human protein toxic in monkeys!!! Interestingly, when we produced the monkey protein homologue it did not show toxicity in the cynomologus monkey tox studies. The project came back to development! The product made it to the clinic through curious perseverance, critical thinking, and multidisciplinary collaborative technical rigor of the team. This model of “R” and “D” partnership became the new way of doing business early in development. The model proved to be critical for a late stage program when years later I had to defend a major objection to a market application on the basis of lack of comparability following process change. We had seen some differences in glycosylation when a transition was made from serum-containing to serum-free process of a marketed product and had attempted to obtain approval based on only in vitro comparability studies. It took an integrated look at all available biological and chemical data through the partnership of Preclinical and Development scientists to write a compelling story and re-submit within one month of the Major Objection that convinced the regulatory bodies to approve the product as is (with commitment to follow immunogenicity in patients). Twenty years into biologics development, I see the time and cost savings of an integrated way of developing products, not constrained by the boundaries of different departments. STC Biologics is founded on such boundary-less merge of disciplines, as the knowledge of biology, process development, analytics, formulation, and regulatory sciences are all in one team body. The broad cross-discipline skills of the team members have allowed agile resolution to technical hurdles at a significantly lower cost. It was this natural nonhierarchical company culture that allowed solving the impurity-related clinical hold issue for a client’s product by creatively developing a biological assay to monitor the impurity, and nimbly developing a rational process to minimize it.